Chordpad is another son tool of VPDpro.It is designed to bombard the selected track of chords, both in the normal edition and in live writing.It is possible to control it by means of the mouse , or by means of MIDI Input. ChordPad is divided into three parts. In the upper part there is an octave selector. In the middle part, there is a virtual piano, with 12 effective notes , representing a complete octave. In the lower part there is a frame with up to 59 pads of chord types. ChordPad is capable of playing the 59 types of chords and changing its octave and root note directly, without any expensive and overloaded graphic interface.You can play any type of chord to change, or change the root note directly from the virtual piano. 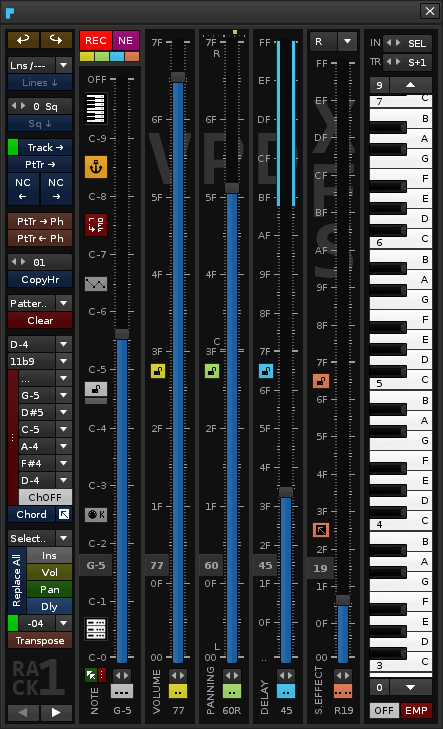 So you can play or record more than 5900 chords with this simple GUI.To start playing, initially it is necessary to select a octave and a root note.The interesting thing is that you can handle the 12 keys of the virtual piano and the types of chords with 12 pads and a pair of wheels from a MIDI pad or MIDI keyboard.It is very fun to play with these peripherals.Using only the mouse is also fun, but through MIDI Input you can change faster, and directly control the transposition of the chord. ChordPad shows the notes that form the chord when the user plays. In addition, it is able to recognize/locate the type of chord as reproduced in the pattern editor, from the root note selected in pattern editor. Two more details included are the mother tool, VPDpro. The first is the volume bar, which controls the volume value of each note of each chord before it is written. In addition, VPDpro allows to migrate each track pattern to the selected phrase of the selected instrument and vice versa, in case the user needs to migrate their chords or rhythms within a phrase. Will the extended chords have options for closed vs open voicings? With Renoise the posterior edition is very powerful if it is used correctly. Compose a base with chords. Then modify what you need while you are reproducing what was previously written.At the moment, ChordPad does not have advanced handling options. Similar concept to inverting chords, but you shift around the “central notes” not changing the bass. Roughly: Closed voicings have intervals closer together whereas open voicings have more spread between the notes. either way, the tool looks very powerful as it is so far! Wow, it’s a damn good day for it, first Joule’s demo and now this! Any chance of a demo video with audio, Raul? At the moment I do not waste time editing videos with audio. But I assure you that the tool sounds. You can play and try chords, without recording anything… or record live. Well, this is very far from an accompanying tool. But basically, you just have to create a rhythm on a track 1, even if it sounds repetitive, and then you only play the chords with the tool on a track 2. After doing that, you can modify and tune the track of the rhythm and the track of the chords to your liking. They are only 2 or 3 steps, and you are manipulating the notes directly written in the pattern editor. The tools can help you to experiment as well. But the fastest, and what is interesting, is to have your notes written, and not be burning the mouse with many clicks.A tool that forces you to make many clicks can be antiproductive. Remember that the objective is to write in the pattern editor. Everything written there can also be reproduced later from the pattern editor, to modify it if necessary.This is how all my VPDpro tool is focused. The clearest example is that you have a vertical bar to transpose a note with the full range of available notes. You do not even need a keyboard.Compose your base and modify later. Ledger, at the programming level, is like changing one chord for another, since you are only modifying a central piece.Technically it would only be to change a sum.I have programmed the chords using simple additions, taking as reference the root note, as a value of 0. A sum is responsible for each type of chord. So I get all the notes that make it up. If you intend to invest, or modify a chord, you only need to modify the sum.Perhaps it would be possible to increase the number of chords, with such investments or modifications of open / closed voices. But at the moment ChordPad is in version 1.0. I wanted a basic tool to bombard chords, without too much complexity. But I do not download modify and expand options in the future.Whenever it is to modify chords, it is feasible to be programmed. So it’s a completely new invention then from the sounds of it, I follow what you’re saying and don’t recall ever seeing anything like that. Love the way the chord pads highlight as the pattern runs through them, it’s little things like that can really make a difference to enjoyment due to being subconsciously satisfied by feedback. It seems silly, but ChordPad you have two things frankly useful not to miss. The chords are complicated to read, I do not speak of the name, but of the notes. That a virtual piano shows you correspondence of the notes according to the type of chord and its root note helps a lot to learn and to locate. Also, if you see a track full of chords, you easily get lost when determining what kind of chord is playing exactly. The Locator helps you directly to find the type of chord, simply with a rectangular marker. You just have to look at the root note at all times.The trick is to never lose sight of the root note. But ChordPad is a small part of VPDpro. The interesting thing is to be able to combine all the available functions to manipulate the notes. I have a mania. Write first, and manipulate and experiment later. In this way, you can write several patterns in a very similar way, or exactly the same, and then manipulate each of them quickly. It is a quick way to compose, very skillful for electronic music. I also compose orchestral music, and this technique is not as useful anymore, unless you use continuous percussion along with some synth chords to set the mood. If you experiment before, you have not written anything yet, and the interesting thing is not to lose the idea. The main issue that I have always wanted to deal with is. I am distracted doing anything, at work, on the street, in the car or in the shower. If a very good melody comes to my mind, I need to run to the computer and be able to write that melody quickly and not get lost in nonsense. So on this road I am. It is not the first time that I record my voice humming the melody that has occurred to me on the mobile phone, because it is easily lost. Good ideas need to be translated quickly. I feel ridiculous then listening to me singing the melody, but it is very useful to compose. Well all my tools are oriented to the same, make it faster to write notes, faster to start. If I need a chord, I can not waste my time doing experiments. So it’s a new invention then from the sounds of it, I follow what you’re saying and don’t recall ever seeing anything like that. Love the way the chord pads highlight as the pattern runs through them, it’s little things like that, design details, can really make a difference to enjoyment due to being subconsciously satisfied by feedback. Yep, the feedback on the buttons is nicely done! Also, does the chord navigator tool have the ability to stay in key? To exclude all chords which are not possible to make from the notes in the chosen scale? @Garrett. If you look at the animated GIF, you will see that the virtual piano and the lower frame with the pads with the chord types are fed back. Actually, the virtual piano is “a trigger”, and at the same time it is “a selector”. The same goes for the lower chord pad, it is “a trigger” and at the same time it is “a selector”. Ok, if you select the “C-” key on the virtual piano, it will remain as the root note.You can play the 59 types of chords based on the note C- as root note.The same goes for the upper octave selector. Change the octave and you are uploading or downloading 12 notes. Now the opposite case. Press a chord type on the lower pad, for example, the chord “7b5”.The chord pad will remain in this marked chord, and you can play the chords through the piano, modifying the root note,and also changing the octave, so that you can play all the possible chords of different root notes of the same type of chord.This feedback system between the type of chord and the root note is the best I have deduced for this compact tool.In fact, it has been the tool that has cost me the most to think until now.Not only do you have to think about how to use it, but also how to program it (LUA/API). Remember that you have the button to activate or deactivate the recording. You can experiment with sounds without writing notes in the pattern editor as well. I have not added a scale selector. I wanted something simple. However, I had thought about how to implement it, before building the tool. The best tool concept I have deduced to include chord scales would have a full panel of all possible chord types by buttons, and a scale selector (drop-down list for selection), so that, if there are buttons of chord types that do not belong to this scale, do not disappear, but the button is deactivated so that it can not be pressed, becoming darker. Thus, the window always has the same shape, and everything remains in place. I guess your first question, you mean if you can change the chord type while keeping the root note. It is not like this? Or am I confused? Or how to bombard the pattern editor with chords. Here I use OSC Server. Each line also lasts. That’s why the delay of the note is added.All the notes that make up each chord have the same delay.In addition, the note-off is also written, with its delay value.If the composer does not want to write the note-OFFs, is possible to deactivate it in: Renoise: Preferences / MIDI: Record & Play Filter : checkbox “Note Offs”. It is also possible to deactivate the recording of the volume value, with checkbox “Velocities”.It is not possible to deactivate the delay value.If necessary, VPDpro has a configurable cleaning function. This live recording behavior can be controlled from a mouse, or from the MIDI input.It is not possible to control it from the USB keyboard, due to certain internal limitations of Renoise, related to the release of the keys. Important note:Do not confuse the note-offs that are written on the same line of the chord, with the note-offs that stop each note below! This is a simple vertical piano, to be able to write or record live the notes through the mouse, using OSC Server, just like ChordPad. The advantage of this piano is that you can play any instrument on any track, other than the instrument selected by default or the track selected by default. 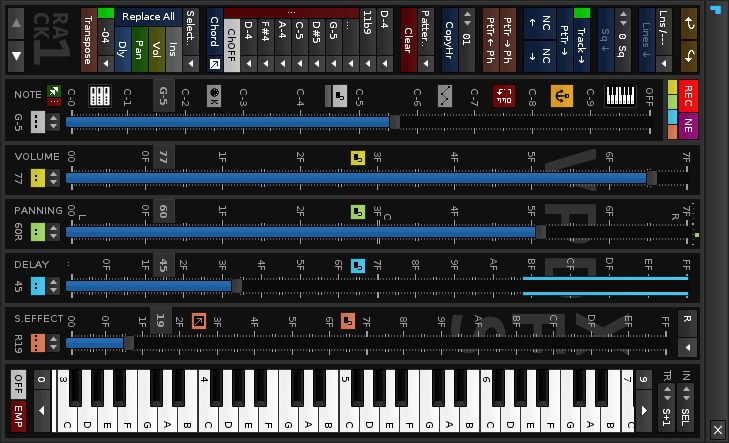 In this way, it is possible to play the ChordPad with a peripheral (MIDI keyboard with Pads, using MIDI Input) controlling the instrument and track selected by default (left hand)… and the vertical piano from the USB mouse, controlling another instrument and another different track (right hand), for example, to play an accompaniment (a rhythm, or a phrase). For all this it is necessary to use both hands. The vertical piano can only be controlled with the mouse.You can play up to 120 notes. It is not possible to control it from the USB keyboard, due to internal limitations of Renoise, related to the release of a key.I could add support for MIDI Input, but it’s 120 notes. It would be necessary to map 120 keys of the MIDI keyboard or MIDI pad. “midi_input” button can be combined with OSC Server. MIDI Inputallows pressed and released. Key Handler can not be combined with OSC Server.The “key.released” does not exist.The code can not write the Note-Offs. It can not stop the sound of a note. The buttonallows pressed and released,so it is possible to use OSC Server with the mouse. Why are the piano keys done sideways though, Raul? I do not understand what questions exactly.The vertical piano can hide it or show it. that? No I mean why have you stood it on end, why not have it horizontal? There is no problem in programming a horizontal or vertical piano for a tool.But this particular tool is designed vertically, the entire VPDpro window. Renoise is made in such a way that it avoids floating windows, and has an order in the panels set. Then, when I design a tool, I try to be as less invasive as possible.This tool is designed to be close to a track, and a track is vertical. Do you find it strange? To be honest I do find it strange, but I feel the same way about any interface elements in any program that are put on their side. That aspect of it would drive me nuts to be honest, and I understand your reasoning for it even though personally I wouldn’t do it that way. I don’t know how hard it would be to implement, but if it was easy enough I’d definitely include an ‘option’ to view it horizontally. At the level of programming it would be almost like duplicating the section of the Viewbuilder. Viewbuilder is the code that defines the GUI of the window, apart from other details that have to do with linking the GUI with the functions to be executed (you press a button and the button reacts by returning an action). Arriving at this point, any person who has problems handling a tool because it is vertical, would be a good step to free his mind of certain chains. For example, the design of a piano has been standardized, but it does not have to be horizontal, vertical, circular, or have only 7 white notes and 5 black notes per octave. In fact, musically speaking based on only the notes available on a piano is to curb creativity. You can go much further.You can go far beyond the standards set by other human beings.You also have to be aware that it is a virtual tool, you do not touch it with your right and left hands, but with a mouse. A case to explain this is the shape of a wave. Why does it go from left to right, or up or down? It does not really matter, because a wave does not travel on a plane, but in a space. It’s a way of representing it, nothing more. So valid is to do it one way or the other. Any programmer will try to do things so that they are not strange, in the end it does not have to. But at the same time you can create things by adapting to certain scenarios. If VPDpro is vertical, it is for several reasons. If that is an obstacle for you, you should not try the tool. Because before you even try it, you’re already canceling it in your head. You still have your chains. Apart from all the above, as I said, any tool always has a personal touch, well marked by the taste of the programmer or even their own limitations (not able to improve a GUI yet). On the other hand, the available API is limited. You can not build everything you want. But it’s big enough to satisfy most of the tools that people share. Why do you think that the creator of the pianoroll tool got tired and left it? Well, it has to do with all this. You reach a point where you can not do certain things, which send the project to the trash. And since there is no support for many months, it is not possible to improve anything internally to continue advancing. Anyway, you have a certain way of thinking. It’s a shame that instead of wasting time writing so much on the forums, do not dedicate it to learning a little LUA and the API to create your own tools. I’m not saying a RAS, but something as simple as a window with a couple of buttons and a couple of functions. VPDpro is that, a couple of buttons and a couple of functions basically, nothing more. Only repeat them differently.You have plenty of time, only you do not want to do it.The LUA language is made for “stupid people”.The most basic is so simple to learn that even people who do not speak English understand it. Look at the situation. There are many users asking for specific things, and nobody listens to them. Your RAS is one of hundreds of things that are in the forums ignored again and again. And some things are even repeated requests. In the end, if you want a specific feature, it is better to do it yourself. Nobody is going to work for you. It is a pity the RAS forum will go to oblivion like many others. And partly it is precisely because of the lack of support of Renoise, and also because of the lack of desire of many users to learn.The same thing happens with the pianorroll tool and many others.But deep down, you can set small objectives, and you’ll go far. which joule demo are you talking about, Renoised?do you have a link? how does one get to try these tools? I think he was referring to a video. I answer to your private mail. It just looks awesome till now, about chords i don’t mind too much i mean, the tool scale finder also does the job quite well in that way.